Front right, Dr. Volker Behrens, Managing Director, Schoenrock; front left, Ivan Donjerkovich, Managing Director, IKAD. In back – On the right, Katherine Shine, US Representative Managing Director, Schoenrock; On the left, Ben Faulkner, Commercial Manager, IKAD. 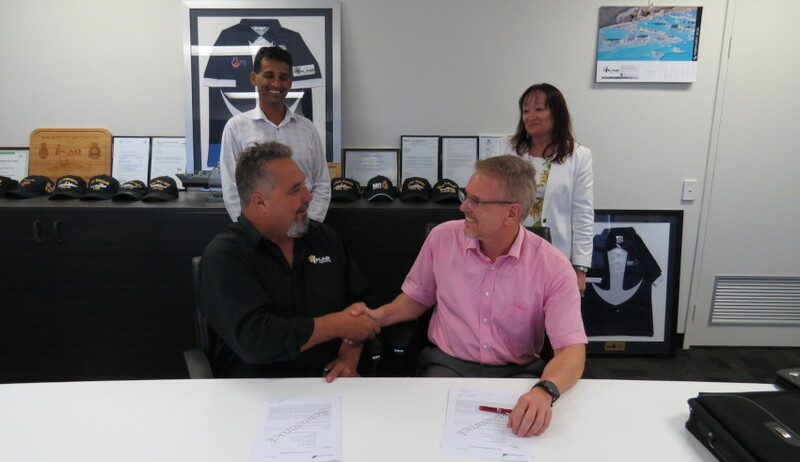 Western Australia’s IKAD Engineering has signed an agreement with Germany’s Schoenrock Hydraulik Marine Systems to build components for naval vessels, putting them in the drivers seat to compete for a SEA 5000 sub-contract. Under the agreement, the companies will work together to market, build and service watertight sliding doors, shell doors and hatches for Australian naval vessels, as well as commercial vessels. Managing director of Schoenrock Dr Volker Behrens said that under the co-venture the German business will transfer its know-how to IKAD. "Australian shipbuilding has a high reputation around the world, and IKAD has a strong record for in-country quality and service. So Schoenrock decided to launch a co-venture that will bring our advanced technologies to Australia," said Dr Behrens. "This will be a long-term relationship that assures not only superior products, but superior after sales service." Ivan Donjerkovich, managing director of IKDA Engineering, added that the agreement will see more Australian content on the German company's products. "It is Schoenrock’s plan to transfer technology, train IKAD staff and gradually increase the Australian content of Schoenrock’s doors and hatches," Donjerkovich said. "This will enable us to compete for contracts that we would not otherwise qualify for." The two companies are hoping to secure a lucrative sub-contract on the SEA 5000 Future Frigates project, regardless of whether BAE Systems, Fincantieri or Navantia wins the $35 billion project.